[NOV. 2, 2002] CHICAGO — Gov. Ryan announced Friday that for the second year in a row Illinois has been ranked first in the nation in the category of education by the Center for Digital Government and the Progress and Freedom Foundation. The latest round of the Digital State Survey was announced today in the areas of education, geographic information systems and transportation, and taxation. Five states tied for the first-place ranking in education: Arizona, Illinois, Indiana, South Dakota and Utah. Three states tied for first place in the area of geographic information systems: Arizona, Illinois and Kansas. “We have made education and technology a top priority of this administration, Through the expansive Illinois Century Network and new opportunities to learn through the Illinois Virtual Campus and Illinois Virtual High School, Illinois has harnessed technology tools that are necessary to prepare our citizens for participation in the global economy,” Gov. Ryan said. Illinois also moved in to the top spot in the area of geographic information systems and transportation for the first time. GIS technology, or providing data geographically, is playing an increasingly critical role in all areas of government. From road conditions to bike routes, crime reporting to environmental protection, spatially mapping data can provide enhanced services, link interrelated issues and create new efficiencies for government as well as industry. In 2001, Illinois ranked first in education and second nationally in GIS. In 2000, the category of education was ranked separately in the areas of K-12 education and higher education. The GIS category was new to the survey in 2001. [NOV. 5, 2002] The speech team from Lincoln Community High School participated in the ISU Invitational Speech Tournament on Nov. 1 and 2. "The first tournament of the year was an interesting and eventful weekend," said Ed Jodlowski, one of the speech coaches at LCHS. He indicated that the improvement students showed during the tournament gave "reason to believe that this season will be very successful." The speech contestants are also coached by Carrie Schreiber. 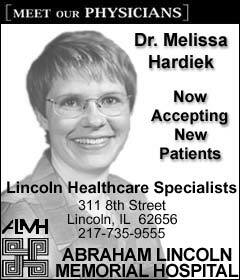 [NOV. 4, 2002] Principal Joyce Hubbard of Lincoln Community High School announced that Kirsten Gandenberger is a semifinalist in the 2003 National Merit Scholarship Program and that Jerrod Marten, Lindsay Struebing and Collin Voyles have been named Commended Students in the program. A Letter of Commendation from the school and National Merit Scholarship Corporation, which conducts the program, will be presented by the principal to the scholastically talented seniors who have been named Commended Students. A total of about 34,000 Commended Students throughout the nation are being recognized for their exceptional academic promise. Although they will not continue in the 2003 competition for Merit Scholarship awards, Commended Students placed among the top 5 percent of more than one million students who entered the 2003 competition by taking the 2001 Preliminary SAT/National Merit Scholarship Qualifying Test. An NMSC spokesperson commented: "The young men and women named Commended Students have demonstrated outstanding potential for future academic success by their high performance in the extremely competitive National Merit Scholarship Program. These scholastically talented youth represent a valuable resource to our nation; it is important to publicly recognize their attainments and to credit schools for the important part they play in their development. We hope this recognition will help broaden the educational opportunities of Commended Students and encourage all students to develop their abilities to the fullest." Semifinalists announced by officials of the 48th annual NMSC program have an opportunity to continue in the competition for some 8,000 Merit Scholarship awards, worth $30 million, that will be offered next spring. Merit Scholarship awards will be underwritten by approximately 500 business organizations and higher education institutions as well as by NMSC’s own funds. "These 16,000 academically talented students come from every state, and although they represent less than 1 percent of U.S. high school seniors, they are excellent representatives of our nation’s youth," commented an NMSC spokesperson. More than 1.3 million juniors in over 20,000 U.S. high schools entered the 2003 National Merit Program by taking the 2001 Preliminary SAT/National Merit Scholarship Qualifying Test, the PSAT/NMSQT, which served as an initial screen of program entrants. The nationwide pool of semifinalists includes the highest-scoring entrants in each state. They were designated semifinalists in numbers proportional to the state’s percentage of the national total of graduating high school seniors. The next step for semifinalists is to fulfill requirements to advance to finalist standing, a prerequisite to competing for a Merit Scholarship award. To become finalists, semifinalists must have a record of very high academic performance, be endorsed and recommended by their school principal, and earn SAT scores that confirm their earlier qualifying test performance. The semifinalist and a school official must submit a detailed scholarship application, which includes the student’s self-descriptive essay and information about the semifinalist’s participation and leadership in school and community activities. About 90 percent, or approximately 15,000 semifinalists are expected to advance to the finalist level of the competition, and some 8,000 of them will win Merit Scholarship awards. All Merit Scholar designees will be selected from the finalist group on the strength of their accomplishments and abilities, without regard to gender, race, ethnic origin or religious preference. Three types of Merit Scholarship awards will be offered in 2003. Every finalist will compete for one of 2,500 National Merit Scholarships, in the amount of $2,500, that will be awarded on a state representational basis. In addition, some 300 corporations and business organizations will underwrite about 1,100 corporate-sponsored scholarships for finalists who meet their specified criteria, such as children of the grantor’s employees or residents of communities where sponsor plants or offices are located. Also, about 200 colleges and universities are expected to finance some 4,400 college-sponsored Merit Scholarship awards for finalists who will attend the sponsoring institution. Merit Scholarship winners of 2003 will be announced in four nationwide releases to news media, beginning in April and concluding in July. These scholarship recipients will join more than 210,000 other distinguished young people who have earned the Merit Scholar title since the first competition in 1956. [OCT. 25, 2002] Brad Aper, Nitashia Brown, Jean Cross, Beth Guy, Stellakay Donaldson, Larry Jones Jr. and Jennifer Tuttle are this year’s recipients of the Anna K. and Bernard E. Behrends Scholarship at Lincoln College in Lincoln. All are graduates of Hartsburg-Emden High School. The Anna K. and Bernard E. Behrends Scholarship is awarded to surrounding county high school graduates with good academic standing. Brad Aper, son of Larry and Nancy Aper of Hartsburg, is studying business. He plans to continue his education at Illinois State University. Nitashia Brown, daughter of Patricia Brown of Hartsburg, is studying veterinary medicine. Jean Cross, daughter of Greg and Barbara Cross of Emden, plans to pursue a bachelor’s degree at Lincoln College Normal. Beth Guy, daughter of Tom Guy of Lincoln and Nancy Guy of Laurinburgh, N.C., is active with the Lincoln College volleyball team and is studying interior design. Stellakay Donaldson, daughter of John Donaldson and Sheri Donaldson Mester of Hartsburg, is studying general education courses. Larry Jones Jr., son of Larry and Susan Jones of Hartsburg, is studying theatre. He plans to continue his education at Eureka College and pursue a career in acting. Jennifer Tuttle, daughter of Jeff Tuttle of Greenview and Lorie Reiners of Emden, is studying accounting and business management.